As you probably know, I live on an island and I like to include island-themed pieces in my shop. I’ve made lobsters, mermaids and fish. A few weeks ago I cut a whale shape out of an old piece of barn board, it’s 24″ long. It sat in my shop for awhile and I felt it needed something extra. So I found an old bed spindle in my pile of wood parts, and a piece of driftwood from a local beach. I ran the driftwood over my jointer until I got a good stable base. Then I drilled one hole in the bottom of the whale and another in the top of the driftwood base. I glued in the spindle after cutting it to length. 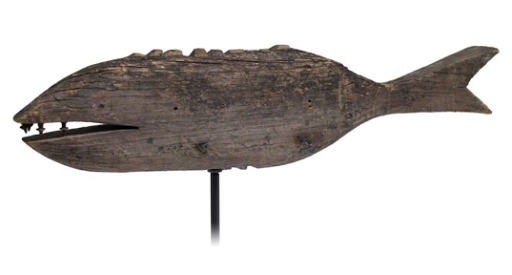 Tada… a whale on a stick! 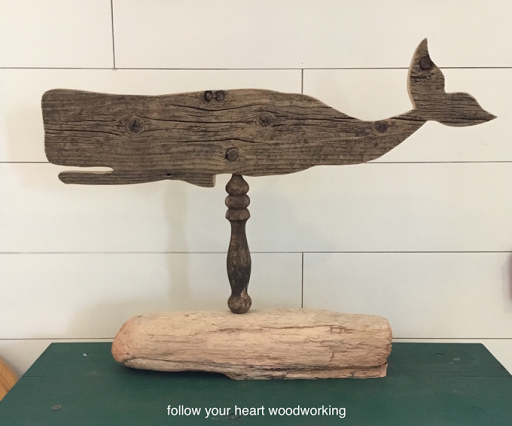 or should I call it a rustic whale weathervane? I wonder if I could charge that for mine? Love this Julie! You are my featured pick for next week, thanks for linking up! I LOVE that whale. The color and texture is terrific. And add to that that it's on a stick!!!!! As Ahab would say "you nailed it!" Great idea! I think you could get a really good price for it!